The Moon corresponds to the Hebrew letter Qof, symbolizing a monkey, or grasping and touching (as monkeys are wont to do). The letter Qof also represents the inner sparks of life being enlivened, just as in the card of the Moon, despite its inherently dark nature, there is always a hidden spark (in the Thoth art represented by the sun’s presence). However, the letter also represents the dark vapor that lingers over corpses, symbolizing both life and death, and representing the reality of the world. The letter is associated also with monkeys, who grasp and touch the world to uncover its truth, and who also often fail to understand it. The ape of illusion is seen on the Thoth’s Magus card, and it is the monkey of illusion whose thoughts are seen reflected in the Moon, for the Moon is a card of disconnect, paranoia, and fear. Astrologically, the Moon corresponds to Pisces, representing unity and compassion. The Moon shows the dark side of the Sun Sign, and represents what a martyr might see before he gives his life – a dark world in need of help, that most people cannot bear to live in. The Moon -especially the full moon – has always been a sign of evil and superstition to some extent, and it is this image that the card reflects. The Rider-Waite art shows the cruel face of the moon looking down through the sun at the world, eclipsing it and bringing night. The scene is almost dreamy, as two dogs bark wildly in confusion, as a lobster comes up from behind to hurt them. 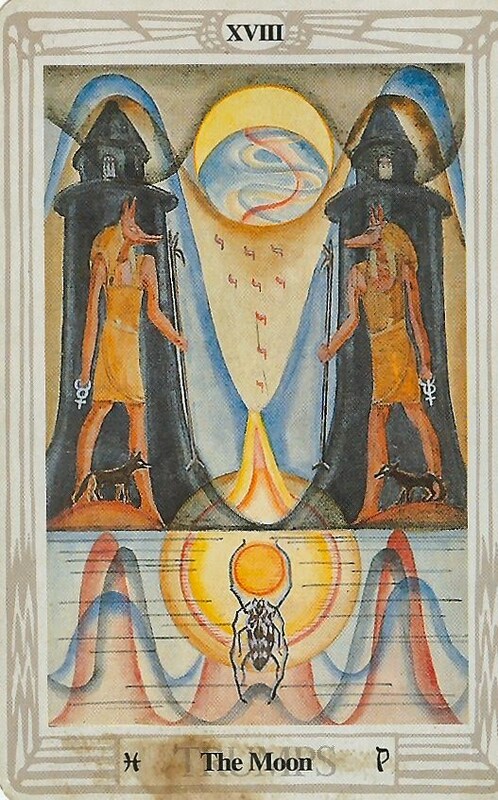 The Thoth art is very dark, and the two towers that appear in the Rider-Waite art are shown more prominently. Before the towers stand statues of Anubis, the God of the Underworld, associated with death. At the foot of each statue are jackals, snarling and and guarding the passage between the two towers. In the background, the moon is eclipsing the sun, and bringing with it darkness and ill portents. The Moon, then, is a card of darkness. It represents illusion and fear, as well as confusion and despair. This card is the card representing you when you are lost in the dark, alone, lost, afraid, and helpless. The eclipse brings with it a sense of hopelessness and foreboding. It is the dark energies of the moon that bring madness and insanity to mankind, and cause him to be prejudiced against his brothers. This card represents the darkness and evil in the world, but reminds us also that the darkness will end. The eclipse is only temporary, and the sun will rise again (seen in the Thoth art by the scarab carrying it) to push back the darkness. In this way, then, this card also provides a lantern light for the child lost in the woods, and the promise of winter’s end. But for winter to end, there must first be a winter. On the Tree of Life, the Moon lies between Netzach (Bliss) and Malkuth (Reality). The Moon, then, represents what happens when one tries to find happiness and bliss in the real world, and find that it does not live up to their expectations; the world is full of darkness, and this dark side does rear its head. Reality is not perfect, and the Moon represents these imperfections; the things lurking in the shadows and hiding in your closet. It represents what could have been in the world, but wasn’t. It symbolizes what came in and filled those gaps. In a reading, this card asks you to examine the role of darkness in your life. It reminds you that hard times will end eventually, but also asks you if you’re afraid and lost. Perhaps something new has happened to you and you don’t know what to do? Perhaps you feel as if you’re going mad? Perhaps you are despairing, or seeing something that is not quite real? This is the card of dark fantasy, so perhaps you feel as if you are living a cruel joke? Reversed, this card’s energies are twisted or hidden somehow – perhaps the illusions are real, or the light of the coming sun is false – or perhaps it is not you who is mad, but everyone else. This entry was posted on July 4, 2011 by Z. M. Wilmot. It was filed under Tarot .